2017 has been another exciting year of growth on this little blog. I'm so thankful for my readers and your support! 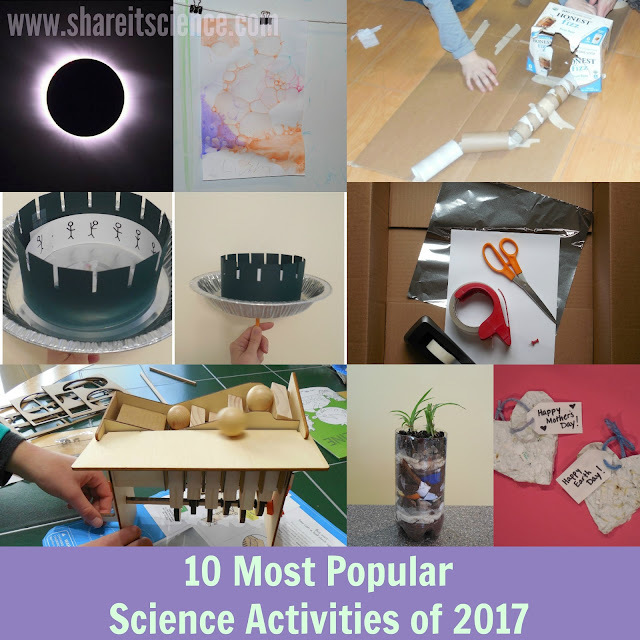 I wanted to share the 10 most popular science activities on the blog this year, as well as announce some exciting changes for Share it! Science in 2018. I'll be taking a brief hiatus from writing any new blog posts as I work towards improving the Share it! Science site. In the new year the site will undergo a facelift, and get some behind-the-scenes updates that will improve the way readers navigate the site. You can also look forward to a regular newsletter that will be full of science, STEM and STEAM resources. There will continue to be content added to the site regularly, just as you've come to expect. I'm really excited about the changes and hope you stick around to see what is in store for us in 2018! In case you missed these science, STEM and STEAM activities, here are the 10 most visited posts from the past year. 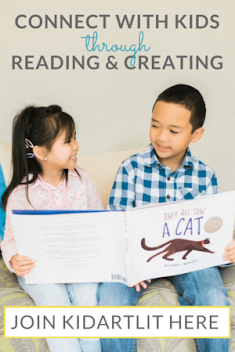 Some are new, a few are oldies but goodies that continue to pique the interest of science teachers, homeschool families, and parents who love providing hands-on learning fun for their kids. 1. Year of the Solar Eclipse! 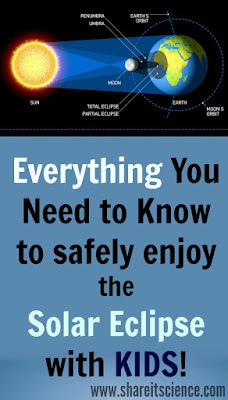 It included resources for finding out where and when the eclipse could be viewed, as well as safe viewing practices. Although it is rare that so many are able to witness a solar eclipse across the U.S.A. we'll have another opportunity in 2024, so tuck this post away again until then! 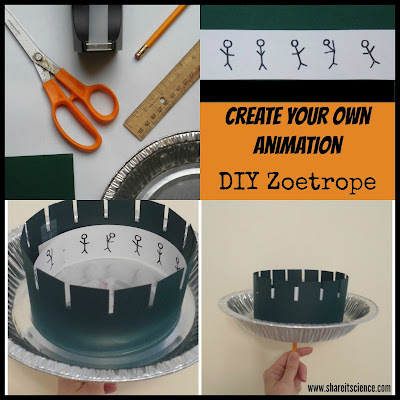 Early in 2017 I wrote this post about making your own zoetrope to create animation as part of a "A-Z STEM" series. Z was for Zoetrope! It quickly became one of my most popular posts of all time and is still very popular on the blog. If you love hands-on projects for kids this is one that will keep them engaged for hours! Hands-on, Minds-on Fun Learning with STEAM Kids! This older post has been a favorite on the blog for 2 years now. 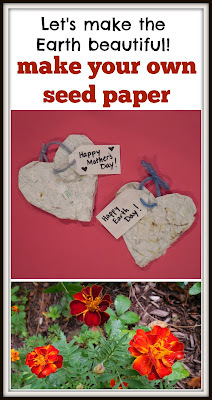 It is a tutorial for making your own recycled paper, infused with seeds. You can plant the paper right in the ground or a pot and grow flowers. It's not only a fun activity to help kids learn to recycle and about nature, but also makes a great homemade gift! Another oldie but goodie, the post "Spies and CSIs" has been a hit for a long time. It includes directions for 2 different invisible ink projects, that don't need candles or a heat source, and a version of fingerprinting that does not require ink. Great for a rainy afternoon, your students or children can create secret messages and a fingerprint database with materials you most likely have on hand already. 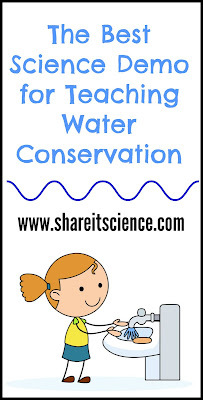 I designed this conservation lesson around a children's book for a Storybook Science series earlier in the year. 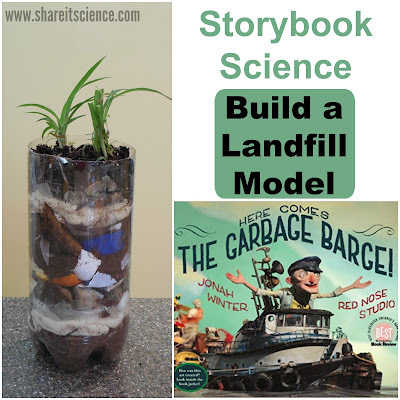 In "Here Comes the Garbage Barge" Inspired Landfill Model you can learn where all of the trash we generate goes and how a landfill works by building a model. I used this lesson many times when teaching 3rd grade science and it was always a fun eye-opener for my students. TerraCycle: Recycle "Un-Recyclable" Items and Make $ for Your School or Non-Profit! 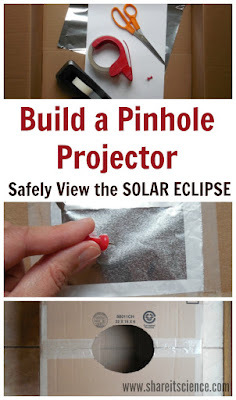 This DIY for building a pinhole projector to view the solar eclipse was very popular this summer as well. This is a great project for kids who like to build things. It requires simple materials and is a great lesson in optics as well as functioning as a tool for eclipse viewing. Teaching kids how to code can help them develop important problem-solving and sequencing skills. 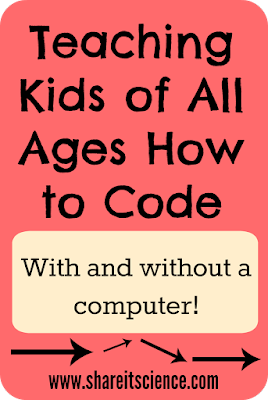 This post on different ways to teach kids coding with and without a computer continues to be a popular one. It is a lot easier than you might think to teach these skills and it doesn't necessarily mean more screen time for kids. If you are a STEM teacher, or any teacher or homeschool family for that matter, and are interested in educational technology, you will also find "Eduporium: A Great Resource for Educational Technology" useful. This water conservation demo was always an eye-opening and effective lesson when I was teaching science. It clearly and easily illustrates how little fresh, clean water is available to drink, and why we must conserve water. The bonus is that it uses materials you most likely already have in your kitchen. If you are looking for more resources for teaching conservation or teaching science and STEM in general, you'll want to investigate the following. STEAM, or the inclusion of art with the STEM disciplines of Science, Technology, Engineering and Math is a huge movement in developing curriculum that stimulates all parts of the brain and engages creative problem-solving and design skills. 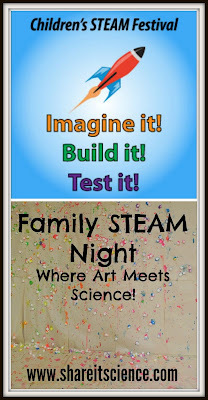 This popular post outlines a Family STEAM Night event I helped to organize at my school. These fun, family STEAM activities can easily be used at home or school. Hands-on, Minds-on Fun with STEAM Kids! 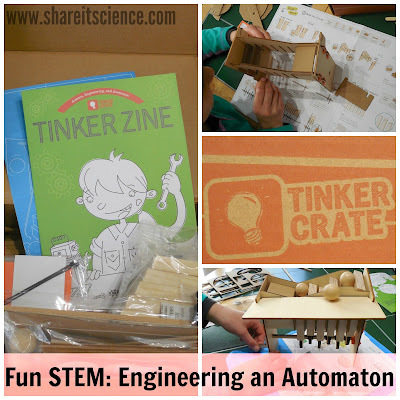 Check out Tinker Crate with us in this post where we use a STEM kit to build our own automaton! A great way to engage kids in tinkering, building and engineering! 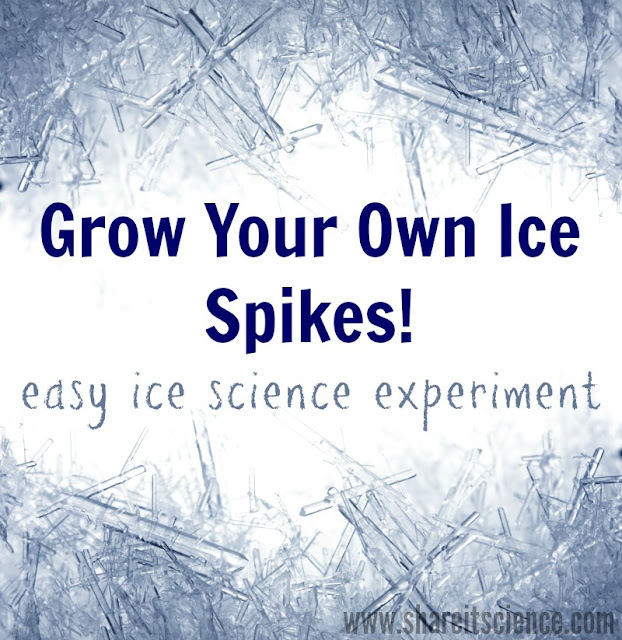 Ice Science: Grow Your Own Ice Spikes! Brrrr! As the weather is turning colder, I start to think about the science of ice and snow. Ice comes in many forms out in nature, from icicles to frost, even ice ribbons and flowers. One structure that is not found very often in nature is called an ice spike. 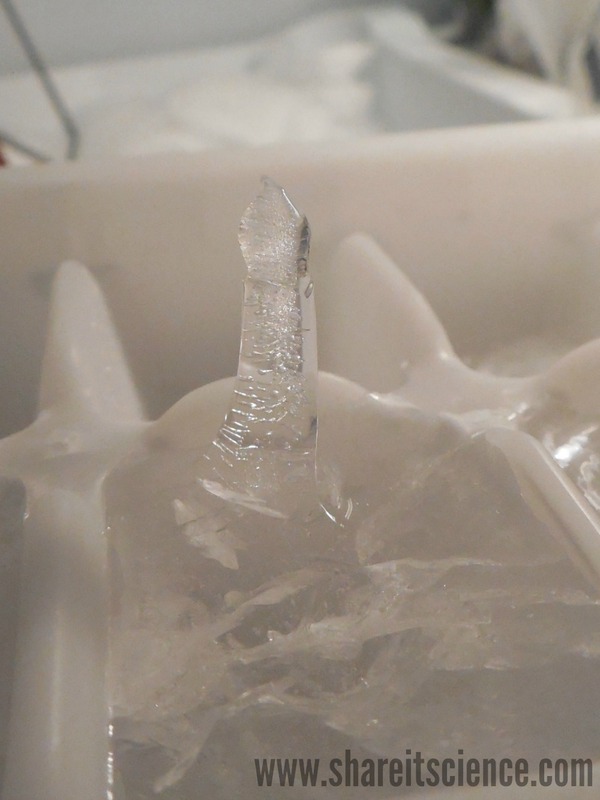 As you can imagine, an ice spike is just that, a spiky column of ice. You can grow your own ice spikes, and challenge students or children to figure out how they formed, easily and quickly using your own freezer. 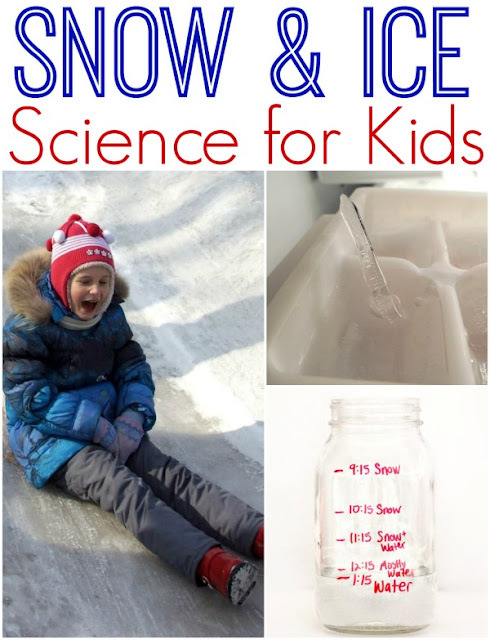 Read on for the directions to get started with this ice science investigation and to find some other great links to ice and snow activities. This post contains affiliate links, meaning I will receive a small commission (at no additional cost to you) if you make a purchase after clicking a product link. Please see disclosures page for more details. You may think that ice is simply frozen water, but did you know that it is actually a type of crystal? Regular ice has a crystalline structure of repeating hexagons or cubes.Various conditions can give ice irregular crystalline shapes too. Ice crystals form around tiny particles or impurities. 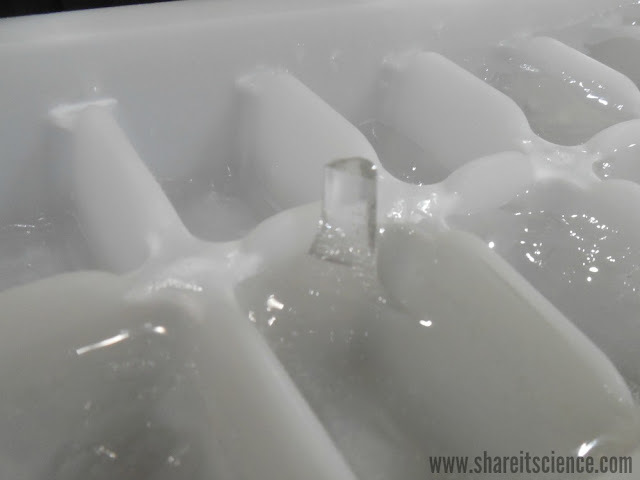 The ice structure grows from these first crystals. To grow ice spikes you need only a few materials. Most kids are probably familiar with how ice cubes form, but you may want to make some with regular tap water before you start this experiment to use as an example. 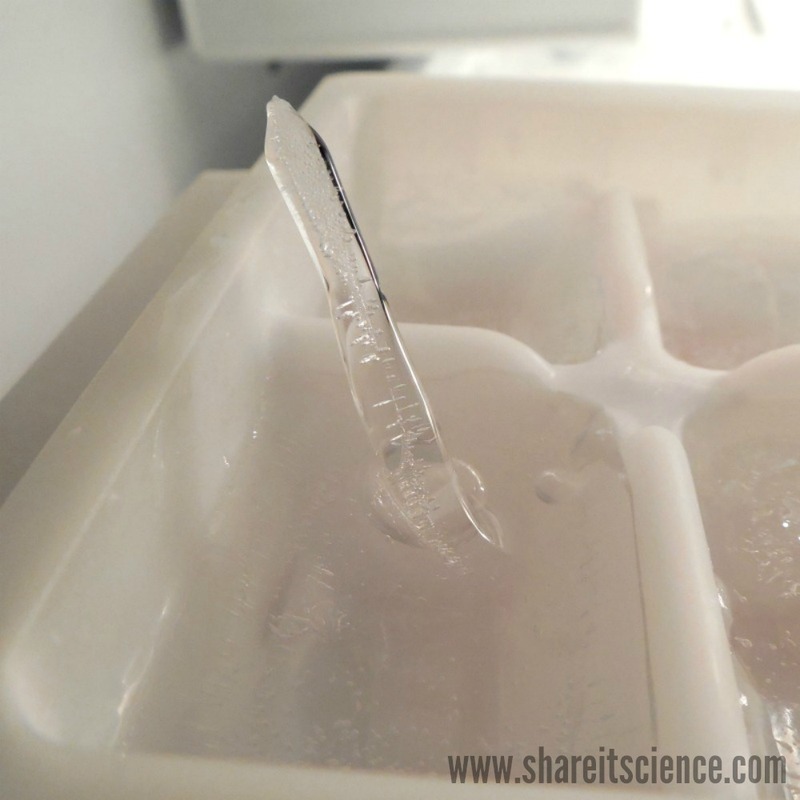 In order to grow ice spikes, all you have to do is fill the ice cube tray with the distilled water and place it in the freezer. The cubes will freeze fairly quickly, so you'll want to check on them every half hour or so. If you want regular ice cubes to compare these to, fill a second ice cube tray with tap water and let them freeze as well. We got so excited about taking photos of the first ice spike that we took it out of the freezer and it began to quickly melt. See below! They can be fragile! You also may not grow spikes each time. We found that filling the ice cube tray up to the top was helpful. 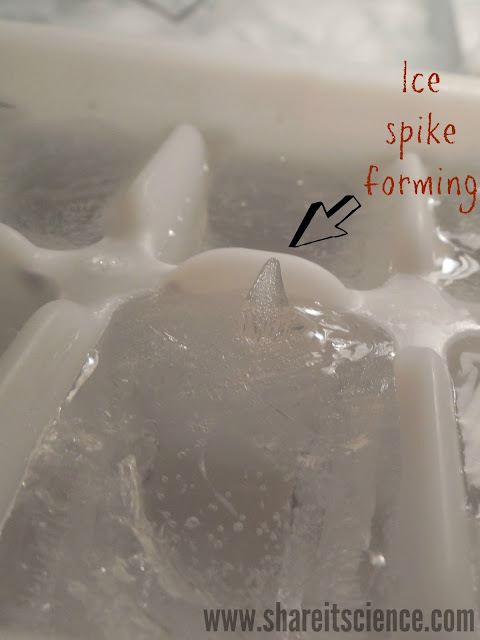 Why Does the Ice Spike Grow? Before revealing why the ice grew these crazy structures, ask your students or children why they think this happened. You can also tell them it doesn't happen very often in nature. Why do they think this is? After a brainstorm, reveal the science. Distilled, or pure water, freezes differently than water with impurities. It freezes quickly because it supercools. In other words, the distilled water freezes at a lower temperature than regular tap water. It can remain liquid water longer, but once it begins to freeze, it freezes rapidly. The sides of the ice cube tray may seem smooth, but small scratches or bumps in the plastic can serve as the spot where the first ice crystals form. The ice cube freezes around the outside first, leaving liquid in the center. As the ice closes in on the liquid water a few of the ice crystals (which are less dense than the liquid water) float to the top and are pushed out of the hole, forming a spike. The spike continues to grow until the entire thing is frozen. Regular tap water has impurities and freezes at a normal freezing point for water. It does so more slowly, and the crystals form more evenly and uniformly. This doesn't result in the center staying liquid the longest, so there is no hole for a spike to form in. Water free of impurities is rare in nature, and that is why you might not see ice spikes when you are out on a winter hike. Winter is a great time for science! There is a ton to learn about seasons, ice, snow and winter wildlife. 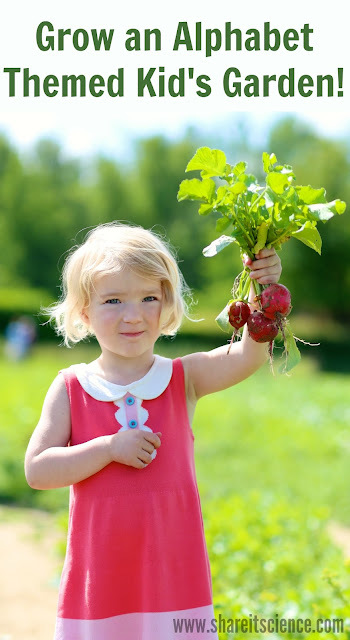 Explore these links for tons of activities to keep the kids busy. Use Math and Physics to Build the Perfect Snowman! Join our E-mail Subscriber List! Grow an Alphabet Themed Kid's Garden! © Sarah Benton Feitlinger. Picture Window theme. Powered by Blogger.